Statistics Canada reports the GDP of each province and industry. The following table shows the culture GDP and number of culture jobs in Ontario between 2010 and 2014. The difference between Culture GDP and GDP of Culture Industries is that Culture GDP refers to any value added by culture products regardless of industry, whereas GDP of Culture Industries includes both culture products and non-culture products in culture industry. For example, food and beverage sales at a music concert would be included in the GDP of Culture Industries, but not in the Culture GDP. The same difference is true between Culture Jobs and Jobs in Culture Industries. The Tourism Partnership of Ontario reports that in 2014, there were 12.3 million cultural visits in Ontario, representing 8.8% of total visits in Ontario. Cultural visitors spend $6.5 billion, accounting for 27% of total visitor spending in Ontario. The majority of cultural visits (75%) were overnight visits, compared to 36% of non-culture visits. Cultural visitors also spent an average of 2 more nights than all visitors. Cultural visitors also spent significantly more per trip ($527/trip versus $171/trip). Several Niagara-based arts, culture and heritage organizations measure and report on their economic impact. The Shaw Festival in Niagara-on-the-Lake and the FirstOntario Performing Arts Centre in St. Catharines are two examples. The Shaw Festival Theatre employs approximately 600 people at the height of the season. It is estimated that Shaw Festival has contributed $100 million locally and $106.6 million to Ontario’s economy. Shaw Festival visitors spent over $42.8 million on regional accommodations, dining, winery visits, and other tourism-related experiences. Event-related spending supports the equivalent of 1,107 full-year jobs, the majority being within the arts and hospitality sectors. The $60 million FirstOntario Performing Arts Centre (PAC), a four-venue facility that includes a 775-seat main theatre and event space opened in St. Catharines in October, 2015. In its first year, PAC hosted over 1,100 ticketed events, sold over 150,000 tickets; and hosted over 200,000 patrons. Several municipalities have developed Culture Plans to more systematically identify and leverage their cultural resources and integrate their development into local planning and decision-making. Creative Economy: Build a diverse economy by strengthening cultural resources and the creative cultural sector to maximize their contribution to economic development. Creative Places: Encourage analysis and inclusion of cultural places, spaces and activities in land-use planning, infrastructure development and programming to preserve and develop distinct and unique places in Niagara. Creative People: Support professional development and information sharing for the creative cultural sector and encourage participation in culture across the Niagara community to stimulate innovation, creativity and community engagement. Creative Identity: Promote awareness, understanding and appreciation of culture and its contribution to the ongoing development of vibrant, unique communities and a shared sense of identity as Niagara. Source: City of Niagara Falls. City of Niagara Falls Culture Plan, 2015. The Town of Pelham’s Cultural Plan (2013) is a strategic planning document that provides a framework of action to direct, sustain and leverage cultural investment in Pelham. In the process of developing the Cultural Plan, 164 cultural resources were identified. Cultivate community cultural awareness, knowledge-sharing and participation in culture. Foster creative industry development, growth and attraction. Develop and enhance cultural spaces and places. Expand and enhance cultural products and experiences. Investment and development of culture through town planning. Demonstrate leadership in the community by connecting individuals and organizations working towards shared cultural goals. Celebrate and enact policy to support community vitality by enhancing the city’s unique cultural spaces and activities. Increase local and regional awareness of Port Colborne’s depth and range of cultural resources. Build a strong and collaborative cultural sector to create opportunities and experiences for cultural development that are inclusive and accessible to residents and visitors of all ages. In 2015, the City of St. Catharines approved Inspire St. Catharines: Culture Plan 2020, which identifies cultural assets and recommends culture-specific priorities to strengthen the sector’s future. It is designed to inform City decision-makers when considering investments, programming, facilities and policies that affect the creative sector, built heritage, and the urban fabric. Communicate the experiences and value of culture to all St. Catharines’ residents. Recognize and embrace the city’s cultural diversity as a cornerstone for civic engagement. 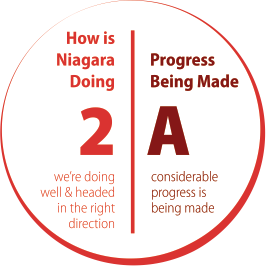 Leverage culture to strengthen St. Catharines’ distinct sense of place and community. Goal 3: Enhance the development of the arts in Welland. Goal 9: Continue to protect, enhance and celebrate the City’s natural, built and cultural heritage assets. In celebration of the 150th anniversary of Confederation in 2017, the Niagara Community Foundation offered a total of $120,000 in Canada 150 grants for local projects that build community, inspire a deeper understanding of Canada, and encourage participation in a wide range of initiatives. These funds were offered as part of a collaboration between Community Foundations of Canada and the Government of Canada. City of Niagara Falls – Niagara Falls Museums $9,000 Pieces of Canada: 150 Objects, 150 Stories – Niagara Falls History Museum is gathering 150 objects from the people of Niagara to tell the story of what it is to be Canadian. City of St. Catharines $12,000 Welland Canal Fallen Workers Memorial Book – editing, design and distribution of a professional standard book of 350 pages, sharing the photos and stories of 137 men who died while constructing the Welland Ship Canal. City of Welland $6,730 Welland 150 Day Countdown –aims to create excitement and encourage engagement in the community through participation in Canada’s 150th celebrations. Suitcase in Point Theatre Company $6,900 In the Soil Festival – Celebrating Canada – deliver three high-engagement arts activities to promote community participation and celebrate diverse meanings of being Canadian. Town of Fort Erie $6,250 Canada 150 Mosaic Project – to celebrate Canada’s 150th, the Town will be creating a mural that will be one of 150 murals across Canada, representing a cultural mosaic, a time capsule, a visual portrayal of history, and an art masterpiece from the soul of the nation. Town of Lincoln – Jordan Historical Museum $6,120 Between the Lake & the Escarpment: Community Art Exhibit celebrating Lincoln at Canada’s 150th – an exhibit focusing on perceptions of Lincoln at the occasion of Canada’s 150th anniversary, featuring artists of all ages from Lincoln’s communities. Veterans Voices of Canada Association $13,000 Keeping History Alive in Niagara – provide archival video documentation of Veteran stories to schools, museums, community groups and libraries as a tool to bring awareness of the sacrifices made to keep our freedom for the last 150 years. DSBN – Fort Erie SS (Dominion Repertory Theatre) $7,400 “But We Said Please!” – A comedic celebratory look at Canadian history and culture performed through a live musical theatre production. Heartland Forest Nature Experience $8,000 Celebrating our Early Naturalists Exhibit and Education Program – Celebrate Canada’s natural history by recognizing the efforts of Canadian Naturalists and their contribution to science and conservation over the last 150 years. I Am Compelled $8,000 Hope Tour: Inspiring elementary students in learning about Canadian heritage, past great heroes and compelling them to be responsible citizens. Niagara Falls Public Library $5,000 Canada 150: Niagara Falls – Then and Now – Niagara Falls Public Library will access photos from our Historic Niagara Digital Collections archives and create reproductions to be placed throughout the city in the historic locations the photos were originally taken. Shaw Festival Theatre Foundation, Canada $5,000 Shaw in the Community – The Shaw will create innovative, high-quality programming that will illuminate the history of Canada and Niagara, resulting in the immersive and dynamic theatrical events which will engage our community in ways that go beyond the traditional theatre experience. The Essential Collective Theatre $10,000 The Welland Canal Play – an original theatrical presentation for all ages about the history and impact of the Welland Canal in Niagara, and about the people who toiled over the past 150 years to create this vital waterway. The Weir Foundation – The RiverBrink Art Museum $8,000 Dreams and Schemes – Building the Welland Canals – an exhibition of art works depicting the Welland Canals from the earliest renderings of both actual and imagined projects in a broad survey spanning the 19th to the 21st century. Town of Niagara-on-the-Lake – Queenston Residents Association $9,000 Queenston Celebrates Canada’s 150th – 3-part event including: indigenous trees planting, guided walking tours exploring the built history of the village, and a village ceremony with civic speakers, a choral performance, barbecue and lawn games in the new village park. Wainfleet Historical Society $1,600 Feeder Canal Plaque – Create and erect plaque which outlines the history of the Feeder Canal and its significance to the development of Wainfleet. The Niagara Investment in Culture program promotes culture in Niagara by funding a range of innovative and collaborative projects. Since 2015, over $587,000 has been invested in the community through this program. Source: Niagara Region, Niagara Investment in Culture Program. Landscape of Nations is a moving public artwork of deep meaning that was unveiled in October 2016 on the grounds of the historic battle of Queenston Heights. It acts as an official recognition of the critically important contributions of Indigenous Peoples during Canada’s formative years, and particularly during the War of 1812. The memorial is also a symbol of our collective history and friendship with Indigenous communities. The $1.4 million project was a joint investment by the federal, Ontario, and local governments, the Six Nations Legacy Consortium, and many donors. It includes two bronze sculptures of Indigenous leaders John Norton and John Brant, time markers indicating the start of the War of 1812 and when peace was achieved, bronze medallions integrated into a memory circle, and a Tree of Peace under which children buried weapons of war at the unveiling. The project to create the memorial began in 2008 by The Working Group, a subcommittee of the Niagara-on-the-Lake War of 1812 Bicentennial Committee. They received $420,000 in funding from the Canadian Heritage Legacy Fund, and a fundraising campaign raised the remaining amount. The Welland Canal Fallen Workers Memorial was unveiled in November of 201, to honour the 137 men whose deaths were documented during the 18 years (1913 to 1935) it took to build the fourth canal. The loss of life on the project is believed to be the largest of any federal government infrastructure project in Canadian history. The fourth Welland Canal was built to expand shipping routes and connect the Great Lakes to eastern Canada, western New York and global trade routes. To this day the Welland Canal continues to serve as a major transportation corridor, contributing billions annually to the Canadian economy. The unveiling of the memorial marks the completion of years of research and fundraising by the Niagara community, including elected representatives, historians, the marine industry, labour, local media and volunteers who were committed to fulfilling the 85-year-old promise to honour the fallen workers. The Welland Canal Fallen Workers Memorial was designed by Dereck Revington Studio Inc. of Toronto through a national competition. The memorial features four elements – the Gates of Remembrance, the Veil, the Timeline and the Lock – all set within a contemplative grove. The memorial was constructed at Lock 3 of the Welland Canal to serve as a reminder of the fallen workers. With a budget of $1.2 million, the memorial has been made possible with funding from the Department of Canadian Heritage, the Niagara Region, the City of St. Catharines and significant donations from the marine industry, local businesses and the labour community.